Process Parameter Management & Data Acquisition. There are several batch processes that need historical data, which makes the documentation of measured variables essential. 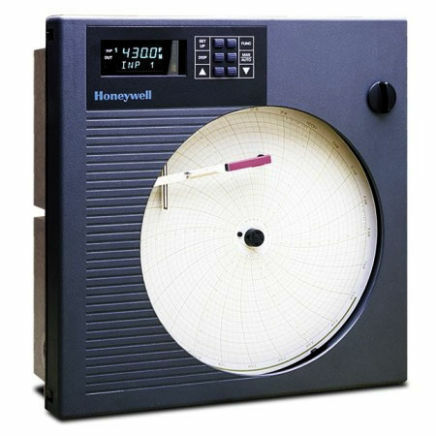 Honeywell’s Circular Chart recorders offer a cost-effective way to maintain these records and help manufacturers optimize the data collection process. The recorders are microprocessor-based and can record a variety of process parameters such as temperature, humidity, pressure or flow from transmitters. These are ideal for high-performance applications requiring accuracy such as those used in dairy, textile and food machinery, industrial ovens, environmental chambers, pharmaceutical equipment, metalworking, industrial furnaces and farm machinery. What Is It? - ​The DR4300 10" circular chart recorder is a one- or two-pen microprocessor-based recorder that can handle a variety of process parameters from devices such as temperature, humidity, pressure and flow transmitters. It uses preprinted charts and fiber tip pens and is available with and without a digital display. Easy to operate and maintain, it is ideal for most process recording applications that can be handled by low-cost analog recorders. The Basic DR4300 has a typical accuracy of 0.50%, while the DR4300 recorder with display can be field calibrated to improve the typical accuracy to 0.2%. This circular chart recorder also supports PID control and alarming for those processes that require both recording and control in a single device. How Does It Work? 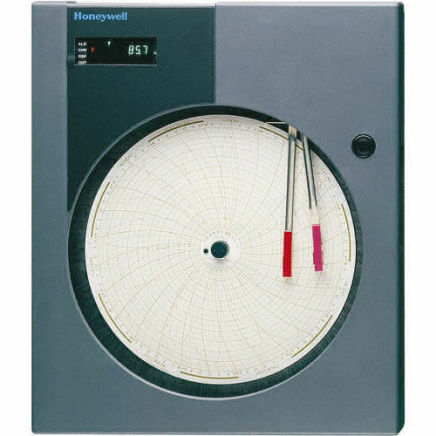 - ​Honeywell Truline Circular Chart recorders accept directly connected process signals which allow them to process data and create the chart under actual environmental conditions, eliminating the risk of temperature and humidity expansion of the paper and enhancing its accuracy. The chart recorders use single or dual pens or a “hot-stylus” type pen to produce the chart image. The simple design of these chart recorders makes them easy to operate even by inexperienced operators, and the modular construction makes them easy to maintain, modify and service. The bright, digital display and a dedicated configuration keypad bring further convenience to the user. These chart recorders come with NEMA 3 or NEMA 4 front face protection, making them suitable for tough production environments. What Problems Does It Solve? - The DR4300 circular chart recorder offers the most economical solution for recording one or two process parameters. What Is It? - ​The DR4500 circular chart recorder is a microprocessor-based recorder suitable to meet a wide range of industry requirements. It comes with a digital display and easy-to-use operator interface, and is available in many models to cater to the specific needs of different applications such as flow and HTST dairy processes. The Truline pen provides a convenient method to document a process while minimizing maintenance hassles. An integral PID controller and RS-485 Modbus communications ensure user empowerment. This accurate and easily configurable recorder is designed to work in tough industrial situations. What Problems Does It Solve? - ​The DR4500 circular chart recorder eliminates the need to purchase individual circular charts for each application with its single circular chart requirement, thereby enabling cost savings to the user through reduced stocking of multiple circular charts.